Named after the centuries old traditional recipe, Pound Cake is marked by its creamy and balanced flavour. 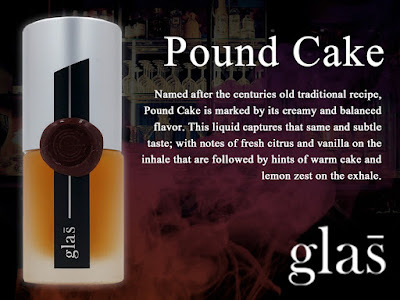 This liquid captures that same and subtle taste; with notes of fresh citrus and vanilla on the inhale that are followed by hints of warm cake and lemon zest on the exhale. The juice comes in 15ml & 30ml bottles. You have the choice of 0mg, 3mg, 6mg, 12mg nicotine. My preferred nicotine level is (3mg), High VG. Average cost in the UK for 30ml is- £16 and for 15ml £8.95 (Prices Vary). They can be found in most online stores and bricks & mortars at the moment. They have a nice collection to choose from. The bottle comes with child safety cap, tactile warning label but no use by date that I could find. The label is clearly printed and easily read. The presentation is done beautifully and every bottle has a wax seal on the outer lid and a child safety cap on the inner lid, which is a lovely touch. My opinion of the e-liquid I am reviewing today is my own, and will be my true and honest opinion as always. Taste is very subjective and what I dislike you may enjoy, and vice versa. Remember e-liquid flavours vary depending on the power, resistance and airflow of your chosen devices. Different setups give you different flavours at lower and higher temperatures, so please keep that in mind. Every batch of Glas™ liquid is mixed to the highest standards for consistency and quality of flavour using the best flavorings and ingredients we can find to create one of the finest e-liquids available on the market. Each one of our bespoke flavours have been crafted through a rigorous development process in order to birth truly unique flavour profiles. Great care and attention is placed on finding the best combination of ingedients to give you the best overall flavour. On Opening The Bottle, I could smell the subtle nuances of a buttery lemon aroma. It had a smooth lemon scent, and was in no way citrusy or sharp, but rather light & mellow. The madeira sponge/Poundcake aroma was creamy with a light cakeyness and smelled divine. On the Inhale, a light zesty sugary lemon taste, rolled smoothly over my palate, making my tastebuds come alive. Sweet and buttery with just the right amount of flavour to give a good vape without being too rich or sickly. It reminded me of a sugar lemon syrup poured over a warm buttery madeira cake, oozing with vanilla cream, balancing the sweetness with the zestiness, and as they say, "just like mother used to make". On the exhale, the perfect balance of flavours blended harmoniously together. Again, very smooth and very light. It is a clean and refreshing vape. Creamy but in no way sickly. Sweet but not overly sweet. A perfect combination of flavours. The zestiness of the lemon has a calming effect, as the vanilla tones everything down. The cakeyness comes at the very end of the exhale, reminding me of a creamy and very moreish cake batter. Summary:- A beautifully well balanced e-liquid. One you could vape all day. Very refreshing on the palate, but at the same time comforting and warm. Final Thoughts................... I really enjoyed this e-liquid, and I will definitely be buying more when my 30ml runs out. I recommend this e-liquid to anyone who enjoys a good dessert juice and doesn't mind citrus flavours. http://casaa.org/ - CASAA - The Consumer Advocates for Smoke-free Alternatives Association. Join casaa.org and Fight for your right to vape.